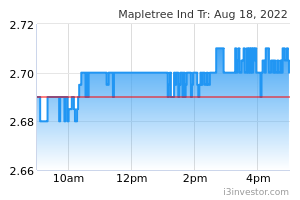 Mapletree Industrial Trust (MIT) recently announced its proposed acquisition of 18 Tai Seng from its sponsor Mapletree Investments Pte Ltd for an agreed property value of S$268.3m. The property is a nine-storey high specification mixed-use development located in the Paya Lebar iPark, has a total GFA of 443,810 sq ft and was completed only in Nov 2016. This proposed acquisition is another positive step by MIT to move further up the hi-specs value chain. Post completion, the Hi-Tech Buildings segment will form 42.7% of its AUM, versus 39.2%, (as at 30 Sep 2018). Operating metrics of 18 Tai Seng includes a high committed occupancy level of 94.3%, although physical occupancy was 87.4% (as at 30 Sep 2018); while 95.7% of leases have some form of annual rental escalation. Current WALE is ~3.6 years. The property is expected to generate an initial NPI yield of ~6.8%, which is higher than MIT’s existing portfolio NPI yield of 6.4%. Although final funding structure has not been decided, management intends to make this transaction DPU and NAV accretive. We assume full debt funding at this juncture, and raise our FY20 DPU forecast by 2.4% (FY19 unchanged). Consequently our fair value moves from S$2.01 to S$2.04. An EGM will be held on 22 Jan next week to seek unitholders’ approval on this acquisition. Given the positive merits, we recommend unitholders to vote in favour of this purchase. Other recent developments for MIT include the signing of a long 25-year lease agreement with Equinix at its 7 Tai Seng Drive property, and subsequently upgrading it to a data centre. Upgrading works have already commenced progressively since Sep 2018. Looking ahead, although there are concerns of continued negative rental reversions amid challenging manufacturing and industrial data points globally and in Singapore (which we agree with as well), we believe management’s drive to scale up the hi-tech value chain will help to mitigate some of the weakness in the traditional industrial space. Time is needed to extract more value from this transition, but management is clearly moving in the right direction, in our view.